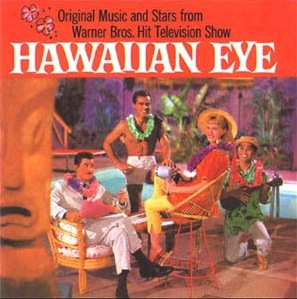 The 162nd Soundtrack of the Week is music from the television series Hawaiian Eye. The music comes from various composers but is apparently arranged by musical director Warren Barker. My favorite piece is the main title, a Les Baxter/Henry Mancini type groover that I'd heard previously on Buddy Morrow's Double Impact album. The composer credit is given as "David, Livingston". There's not a lot of info on this CD. "Vallee, Henderson" wrote the hypnotic and swinging "Deep Night" and Maurice DePakh gets credit for the martial "Steele on the Prowl". "Soft Green Seas" is an island atmosphere with a bluesy swing section by "Fiorito, Weeks, Anderson". "Audinot, DeBru" came up with the propulsive "Rhumba Rhapsody" and Charles Henderson penned the laid back, West Coast jazz-influenced "Cabbie Kim", which has nice use of Hawaiian percussion. The spirit of Esquivel seems to guide Charles Henderson's "Cricket's Corner", with its space-age reverb strings and percussion. Maurice DePackh also contributes a second tune, the bluesy bongo-accented "Lopaka's Beat". There are also some songs on the CD, Cole Porter's "Let's Do It" and "What Is This Thing Called Love?". The former is sung by Connie Stevens while the latter gets a very cool instrumental rendition with excellent use of electric guitar, vibes and percussion. Robert Conrad sings "You're Getting To Be a Habit With Me" and Poncie Ponce sings "When My Dream Boat Comes Home".